Hello all! It's Sunday! Sunday! Sunday! Have any big plans for your day? I'm recuperating from my very short trip which was only a day but felt like a week. I am not a good traveller. 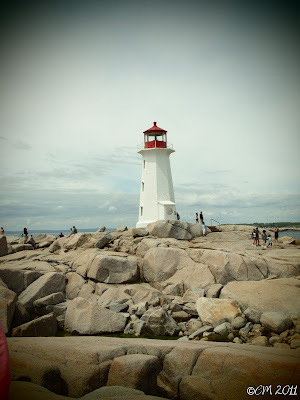 It was just a trip to the city for a little shopping and then to Peggy's Cove. One of the dozens of photos we took. 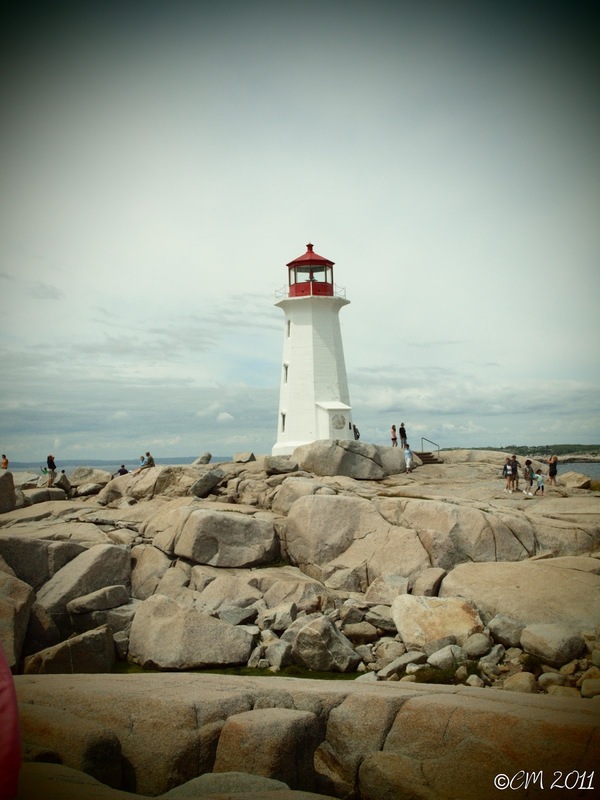 What is a Peggy's Cove? It's a little town that boasts the 'most photographed lighthouse in Canada.' I had been there before but this was the first time in the summer and it was crazy crowded. There were 8000* tourists wandering around. Fortunately, you can just point yourself toward the sea and pretend you are alone. There seemed to be concerts all over the place this weekend (U2, Arcade Fire) but this homebody stayed in and watched Julian Smith videos on Youtube. Yes, I am a party animal. I've also been reading The Luxe by Anna Godbersen. It's one of those scandalous books about rich girls doing bad things. It's a good time to read it as I'm also listening to The Oscar Wilde Collection. Since Wilde pokes fun of the people of the class in that time period, it's a nice companion. The books I've been wanting for came in the mail this week. Yay!! After reading The Yellow Wallpaper, I knew I must read more of Charlotte Perkins Gilman so I ordered Herland. I also bought my first (!) Persephone Books Someone at a Distance by Dorothy Whipple. And finally from NYRB A Month in the Country by J L Carr. In other news, Book Blogger Appreciation Week is accepting nominations now! Please go nominate your favorite book bloggers. Some of the rules have changed since last year so go check it out. This week expect reviews of Agatha Christie and The Wild Rose by Jennifer Donnelly. Hope you come back for those! See you around the internets! * Not an accurate number. In fact, probably a wild exaggeration. Yay, Peggy's Cove! I haven't been there in a while... I want to go and take the boat tour where you can see the lighthouse from the water. We were supposed to go last year, but it never happened... I like it better with fewer people, but in order to do that it is freezing! Going away for a day can be exhausting, but I still love to do it. C.B.- That would be very tempting! Alyce- It's a gorgeous spot. Kailana- I was there in the fall last time and it was cold and wet. Yes, we'll have to meet up sometime. I can totally relate to those hordes of people. I swear there were also 8000 people at our beach this weekend. Okay, it was probably 80, but when the beach is usually empty, 80 looks like 8000. I love the lighthouse photo...I've got a thing for lighthouses. They're just so cool. Peggy's Cove is so awesome! I could wander around those rocks for hours!